Gail Landau has always been a cat person. Growing up she regularly had 5, 6, 7 cats around, lovingly dubbing her mother the “original cat rescuer.” Today, her and her daughters, Erin and Sasha, regularly show their feline devotion by wearing those Charlotte Olympia cat shoes that every diehard cat lover covets (you know the ones). It’s safe to say, cats are a family affair for Gail and co. — they’re in the atmosphere. On a family vacation to Charleston, South Carolina, she knew she had found her answer when she came across the cat café, Pounce. “I’m very faithful in my belief that things come to you karmically, when you’re ready for them,” she recalls. It was time for her to bring the first cat café to Orange County — it would be called Catmosphere. Cat cafés originated in Asia in 1998 but didn’t gain popularity in the States until around 2014. In a nutshell, they are a sanctuary of sorts, where patrons pay to hang out with friendly felines in a safe, comfortable environment that kind of feels like your living room — a far cry from the cold, dungeon-like vibe of animal shelters. There’s a few cat cafés in LA, one each in San Diego and Santa Barbara, but Orange County had none, and Gail was about to change that. Within five days of her return home, the determined cat-trepreneur was at City Hall with a business plan that covered any questions she was sure to receive — yes, it would be part animal shelter, and yes, part café as well! The city didn’t know what exactly a cat café even was, so she had to inform them. She had to deal with zoning, permits, health codes, but as she went on, with every check she marked off the list, she came across fellow cat lovers who wanted it to happen as much as she did. A year and two months later, on August 13th, 2018, Catmosphere Laguna opened on Forest Ave with Gail and her daughters at the helm (Erin is Director of Wellness, and Sasha is Director of Human and Feline Relations). What used to be known as Laguna Specialty (a winery), was now a special place for Laguna’s luckiest four-legged friends. The final product is absolute heaven for cats… and for the people who love them. The “Kitty Lounge” houses about 15 at a time, serving as a foster home until they are adopted into their “furrrever” homes. The Lounge is decorated in total Laguna Beach style which Gail designed herself, complete with a 6’4 palm tree, wave mural, surfboard resting nooks, and kitty relaxation hammocks (and yes, the cats do appear quite relaxed). Admission is $22 for adults and $12 for children ages 6-17. Separated by a glass wall is the café portion which proudly broadcasts all kitty activity 24/7 on its live “Kitty Kam” (also featured on Catmosphere’s website). Serving coffee, tea, beer, wine, and champagne by the glass, the café is a lively and fun way to start your day (or just to stop by anytime you want an extra large dose of cuteness). Their surprisingly broad menu of breakfast toasts are organized by clever names such as Laguna Breeze (avocado toast at its finest), Main Beach, and Sunset. And then, of course, there are the salads, aptly named with cats in mind — Tuxedo, Tabby, and Calico. Also available for private parties, Catmosphere Laguna has been known to throw some lively ones — whether it’s for First Thursday’s Art Walk, a work function, a child’s birthday, or, of course, one of their regular events like Happy Meowr, Drag Bingo, or Meowoga. 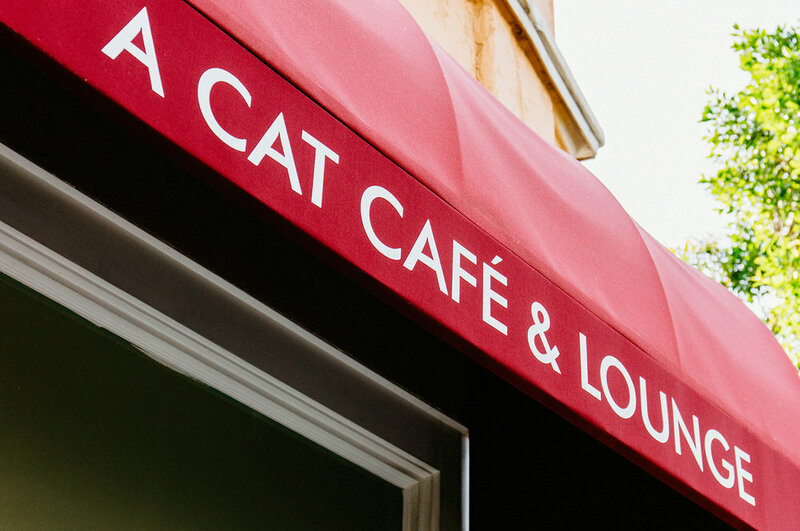 Gail Landau of Catmosphere Laguna really did think of it all when venturing out to be the first of something — she successfully managed to bring the first cat café to Orange County, and we’re pretty sure, the first Meowoga as well. Lindsay DeLong is the Managing Editor of The Fullest and Laguna Beach Living. She has a cat named Pat who is not NOT watching Catmosphere’s Kitty Kam right now. Reach out to them both at lindsay@lagunabeachliving.com. Lindsay will respond. Pat’s busy.